I don't mind watching a bit of sport, where the contest is close and the participants are demonstrating some greats skills and teamwork. It helps if it is a sport I have played. You can appreciate and understand the game more that way. It is unscripted entertainment, some clashes can keep you enthralled and on the edge of your seat. I personally love the V8s, AFL, Soccer. My wife loves Tennis and Golf so I get caught up in those too. We have spent a couple of relaxing Sunday afternoons watching a playoff as the tension builds to unbearable levels at each swing. We admire these people for their skill and discipline. We try to emulate them at our next outing and use some of that discipline in our business and personal life. What I have just described is happening online now. Most people love playing some form of video games, from an iPad app to consoles like Playstation, Wii or Xbox, to massive multiplayer online games like League of Legends. A lot of these you can play against your friends and see how good you are. A lot of these you can play with a stranger on the other side of the world. There are even tournaments organised so players can compete against each other for prize money. You can now broadcast yourself playing a game, you can talk and explain what you are doing and people can chat with each other while you are doing it. Twitch.tv shows these broadcasts. The vast majority of Twitch users don't record their game play, they watch others. You can watch tournaments of top level players, there are even commentators to guide you through the action. 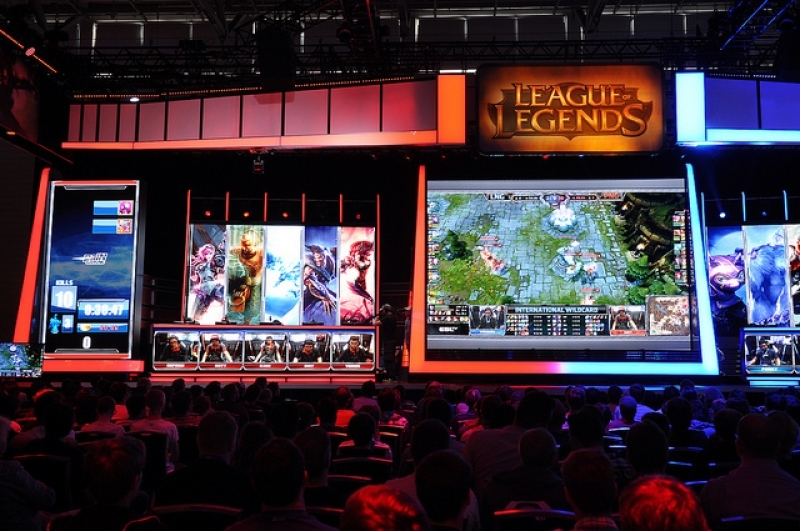 To see it for yourself, you can select from various players channels here for League of Legends on Twitch.tv. Now you will probably have no clue what they are doing, but neither would someone watching AFL for the first time. If you know the game you can appreciate it. And appreciate it they do. In 2014 twitch had 1.5 million players broadcasting their games per month. There were over 100 million people watching these games each month. Let that sink in, 4 times the entire population of Australia watches video games on this website every month. This is now another entertainment option for people, competing against TV and movies. Each video runs advertisments or for $9 a month you can have it ad free. You can also subscribe to individual players or just donate money to them. So for many of these players this is a lucrative full time job. Jeffery Shih plays Hearthstone and has 20,000 consistent viewers every night. Just from livestreaming he makes $100,000 a year. He also has YouTube playing his games and appearance fees to play in certain tournaments. Moving his annual income to $300,000 for playing video games! Is it worth $1 Billion? Amazon thinks so, it bought Twitch.tv in mid 2014 for $970 million in cash. It is a decent business already but consider the upside. What if your favourite chef streamed a half hour show each night and you were able to chat with friends and other fans about it. Your membership could let you save and watch the shows at any time. A teacher could conduct a class on this platform. No tv channels greenlighting a project, no movie producers, just the content creator and the fans. Smaller and smaller niches. People who like something can now find lots of people worldwide that like the same thing. The Internet connects them based on their interests. Instead of everyone watching the same blockbuster or the latest sit-com there is now information, videos and entertainment that is just for you. What niche is your business targeting? How would you entertain them? Contact us today to discuss opportunites for your business online.